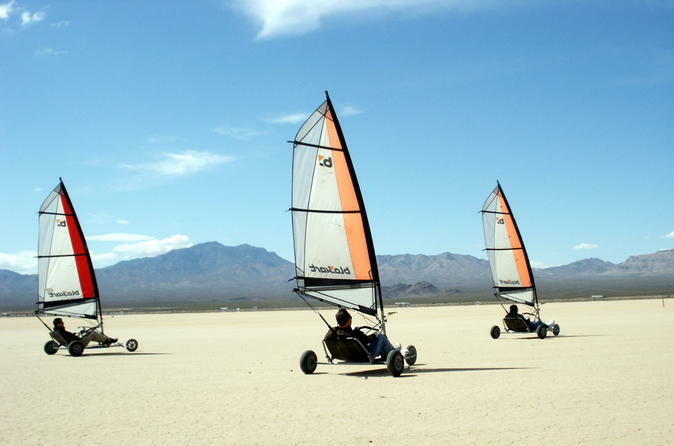 Catch the daily desert breezes at an amazing dry lake just 30-minutes from The Strip for a unique Las Vegas outdoor activities -- land sailing by a wind-powered go-kart. You can pick between a morning or afternoon departure, hotel pickup and all necessary equipment are included. Zoom across desert lake beds like a pro on this half-day adventure from Las Vegas. You can choose between a morning or afternoon departure to fit your schedule. After pickup from your Las Vegas accommodation, you'll be driven to the launch site for your land sailing adventure. After a lesson to get you acquainted with the concept, you'll enjoy time to sail through the desert. Later, enjoy a mini-regatta and race your friends -- prizes will be awarded! Complimentary round-trip transportation, snacks and beverage and necessarily equipment are included. You'll also be provided with a digital download with photos of your experience.